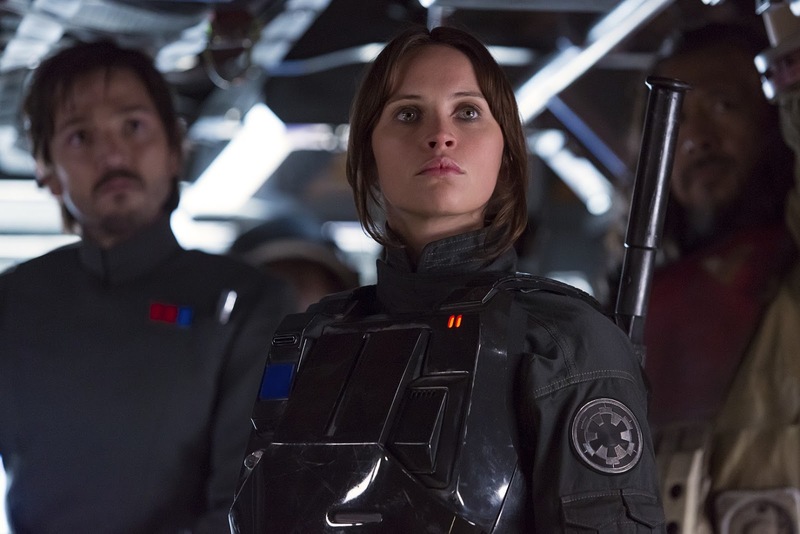 A spin-off story from the Star Wars universe, Rogue One slots in as a prologue to Episode 4. The story of the team that stole the Death Star plans is intermittently entertaining but also over-orchestrated. Scientist Galen Erso (Mads Mikkelsen) is forced by the Empire's director of weapons development Orson Krennic (Ben Mendelsohn) to work on the massive Death Star, a planet-destroying weapon. Years later, Imperial pilot Bodhi Rook (Riz Ahmed) defects, carrying a secret message from Galen to the rebels, letting them know that he is designing a vulnerability into the Death Star. The rebels recruit Galen's daughter Jyn (Felicity Jones) to try and steal the plans that expose the weakness. Jyn teams up with rebel soldier Cassian Andor (Diego Luna) and reprogrammed droid K-2SO, and through contact with master smuggler Saw Gerrera (Forest Whitaker) they recruit blind warrior Chirrut Îmwe (Donnie Yen) and his companion Baze Malbus (Jiang Wen) to the cause. The ragtag group have to launch a dangerous mission deep in enemy territory to try and obtain the vital files. 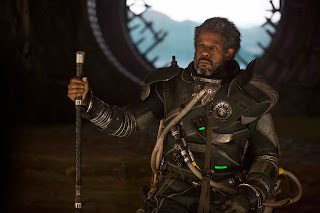 Directed by Gareth Edwards, Rogue One is a sometimes rollicking space adventure, and in its second half occasionally rises to good levels of glossy excitement, Star Wars style. But this is also a story unnecessarily overstuffed with characters, names, events and locations, seemingly for the purpose of setting up additional future spin-off-worthy material for various peripheral people with exotic names. Despite the good intentions and high production values, Rogue One carries the strong nagging sense of a lost opportunity. This could have been a smaller, more intimate and character-driven spy story, more about covert action and smart infiltration techniques as they could exist in the Star Wars universe. Instead Edwards and screenwriters Chris Weitz and Tony Gilroy can't help themselves. After throwing a bewildering number of new names onto the screen Rogue One builds up to a typical and overly-familiar Star Wars climax, dogfights in the sky featuring hundreds of rebel and imperial fighters, massive battleships dominating the skyline, and on the ground the usual multiple breathless cliffhangers, impossible physical feats and running laser battles involving hordes of star troopers. Subtle, this is not. Jyn and Cassian are the most prominent characters, and they have to work hard amidst the overpopulated script to carve out any time and space to emerge as people worth caring about. They get to exchange a few lines of dialogue about sacrifice and personal choices, but then it's quickly onto the next close escape and brush with death. From among the many secondary characters Donnie Yen and Jiang Wen leave the best impression, with Yen's portrayal of a warrior with some affinity to the Force carrying both humour and poignancy. Elsewhere, some familiar names make token late appearances, including Darth Vader, R2-D2 and C-3PO. Much less successful is the disconcerting decision to revive via CGI the long-dead Peter Cushing and superimpose his image onto the role of Grand Moff Tarkin. The image of a young Carrie Fisher is also briefly computer manipulated back onto the youthful Leia. Rogue One offers a familiar space adventure, ticking the usual boxes and choosing the safe and corporately expedient option at every turn.